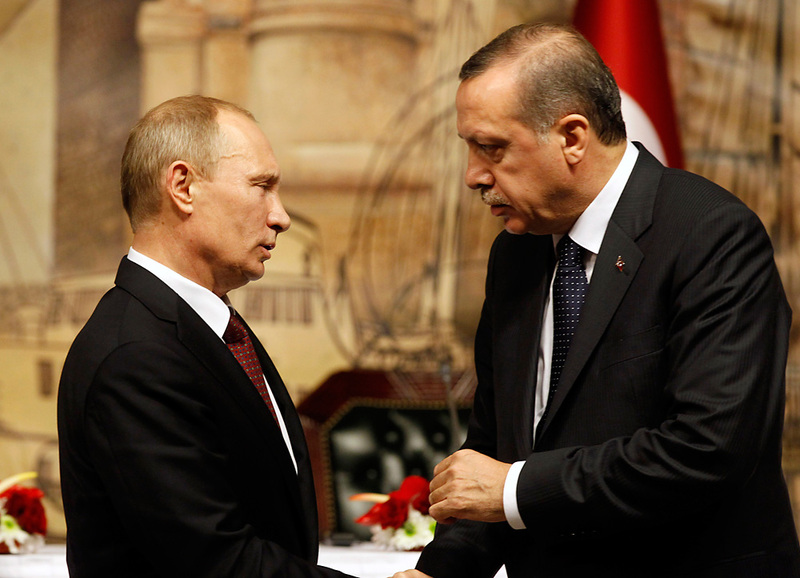 Armed conflict likely between Russia and Turkey? Russia's President Vladimir Putin talks with Turkey's Prime Minister Tayyip Erdogan in 2012. With relations between Russia and Turkey deteriorating, questions of a possible armed conflict between them are being raised more frequently. Russian and Turkish military experts comment on whether such a scenario is likely or not. The Russian Defence Ministry has accused Turkey of preparing to intervene militarily in Syria. "We have serious reasons to suspect Turkey of intensive preparation for a military invasion of a sovereign state, the Syrian Arab Republic," a Ministry statement said on February. 4. The Defence Ministry also released images showing what it said was increased activity by the Turkish army along the border with Syria. "In wartime, this is the way to prepare the transport infrastructure ahead of a military intervention. Such sites are used to ensure the rapid movement of military convoys carrying ammunition and weapons into the war zone, as well as the prompt relocation and evacuation of personnel," the Defence Ministry spokesman said. Ankara has denied the accusations, attacking Moscow instead. "Russia wants to cover up its crimes in Syria," adding "Turkey has the right to take any measures to protect its safety." Saudi Arabia added fuel to the fire by issuing a statement about the possible deployment of troops to Syria, triggering a new wave of speculation on whether a direct confrontation between Moscow and Ankara can be avoided or whether war is inevitable. Vladimir Avatkov, director of the Moscow-based Centre of Oriental Studies, assesses the situation as extremely difficult. In his opinion, the likelihood of an armed conflict between Russia and Turkey is very high. "Turkey had serious plans for Syria," he said. "Russian military action has become an obstacle for them. Ankara now has several options for how to act. Firstly, it may send troops to Syria as part of a coalition. Secondly, it may start to provide more assistance to the Syrian radical opposition. Of course, it may take a wait-and-see attitude and do nothing, but this is unlikely. I think Ankara will actively seek ways to implement the first two scenarios." However, Kerim Has, a Turkish political scientist from the International Strategic Research Organization (USAK), is more optimistic, and says the probability of war is low. "This is for two reasons: regional risks for the two countries and Turkey's NATO membership. Russia will not want to go to war with NATO because of Syria," said Has. Nevertheless, analysts agree on one thing: If there is a military conflict between Russia and Turkey, it can only take place within Syria. Retired Major General Alexander Kostyukhin, who earlier worked in Turkey for some years and is well acquainted with its military realities, believes that despite provocations from Turkey, Russia will not attack Turkish territory, but limit itself to Syria. "If Turkey hits Russian forces in Syria, Russia can strike back only in Syria, but not in Turkey," he said. "However, the Syrian government army, responding to the actions of Turkey, may enter Turkish territory. That's a possibility. Further development is difficult to predict, because it depends on the degree of involvement of other parties. In particular, on the extent of NATO's support for its member state," he said. Viktor Nadein-Rayevsky from the Institute of World Economy and International Relations (IMEMO) at the Russian Academy of Sciences raises a different question: "Will the Turks will be able to secure air cover in the event of a ground operation by Turkey in Syria?" Nadein-Rayevsky said this was unlikely for Ankara, and a military intervention in Syria is impossible without air cover. Kerim Has believes that the Turkish military is not interested in a ground operation in Syria. "Ankara fears that a Kurdish corridor will be created in northern Syria, which poses a threat to Turkey's territorial integrity," he said. "To prevent this, the Turkish secret services are carrying out targeted operations in those areas. But there is no question of any large-scale military intervention in Syria."